Lonicera japonica, known as Japanese honeysuckle and golden-and-silver honeysuckle, is a species of honeysuckle native to eastern Asia including China, Japan, and Korea. It is a twining vine able to climb up to 10 m (33 ft) high or more in trees, with opposite, simple oval leaves 3–8 cm (1.2–3.1 in) long and 2–3 cm (0.79–1.18 in) broad. The flowers are double-tongued, opening white and fading to yellow, and sweetly vanilla scented. The fruit is a black spherical berry 3–4 mm (0.12–0.16 in) diameter containing a few seeds. It is an invasive species in a number of countries. This species is often sold by American nurseries as the cultivar 'Hall's Prolific' (Lonicera japonica var. halliana), and in the UK as the cultivar 'Halliana'. The cultivar is also known as Hall's Japanese honeysuckle. It is an effective groundcover and has pleasant, strong-smelling flowers. It can be cultivated by seed, cuttings, or layering. In addition, it will spread itself via shoots if given enough space to grow. The variety L. japonica var. repens has gained the Royal Horticultural Society's Award of Garden Merit. Japanese honeysuckle flowers are edible to humans and appreciated for their sweet-tasting nectar. The flowers can also be a significant source of food for deer, rabbits, hummingbirds, and other wildlife. 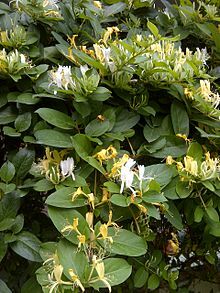 In traditional Chinese medicine, Lonicera japonica is called rěn dōng téng (Chinese: 忍冬藤; literally "winter enduring vine") or jīn yín huā (Chinese: 金銀花; literally "gold silver flower"). Alternative Chinese names include er hua and shuang hua. In Korean, it is called geumeunhwa. The dried leaves and flowers (Flos Lonicerae Japonicae) are employed in traditional Chinese medicine, being used to treat fever, headache, cough, thirst, and sore throat. Japanese honeysuckle has become naturalized in Argentina, Australia, Brazil, Mexico, New Zealand, and much of the US, including Hawaii, as well as a number of Pacific and Caribbean islands. It is classified as a noxious weed in Texas, Illinois, and Virginia, and is banned in New Hampshire. It is listed on the New Zealand National Pest Plant Accord as an unwanted organism. It grows extremely rapidly in parts of America such as southwestern Ohio and is virtually impossible to control in woodland edge zones due to its rapid spread via tiny fruit seeds. Japanese honeysuckle was first found in the US in the late 1800s in Ohio. It aggressively grows over native shrubs and trees, choking them, and can also form mat-like monocultures that prevent the establishment of native species. The succession cycle of a forest is not all that different than a human life span - 70 to 100 years. Accordingly, it is the aggressive displacement that poses a long term threat to future generations of native forests. It is also very difficult to manage in semi-wild areas such as in large rural yards. It can be controlled to some degree via labor-intensive methods such as cutting or burning the plant to root level and repeating at two-week intervals until nutrient reserves in the roots are depleted. It can also be controlled through annual applications of glyphosate, or through grubbing if high labor and soil destruction are not of concern. Cutting the honeysuckle to within 5–10 cm (2.0–3.9 in) of the ground and then applying glyphosate has proven to be more effective, provided that the mixture is rather concentrated (20–25%) and is applied immediately after making the cut. In urban environments of Southwest Ohio where deer population is high, some level of longer-term management has been observed by cutting the honeysuckle to within 18-24" of the ground. Grazing deer substantially slow down regrowth. Once the canopy from a stand of honeysuckle or that of an individual plant exceeds the grazing height of deer, this control method is ineffective. As recently as the late 1990s, Japanese honeysuckle was not considered to be part of a deer's diet, but by 2010 urban deer in southwest Ohio could be observed grazing on it with enthusiasm, especially freshly cut honeysuckle stocks. Lonicera japonica contains methyl caffeate, 3,4-di-O-caffeoylquinic acid, methyl 3,4-di-O-caffeoylquinate, protocatechuic acid, methyl chlorogenic acid, and luteolin. The two biflavonoids, 3′-O-methyl loniflavone and loniflavone, along with luteolin and chrysin, can be isolated from the leaves. Other phenolic compounds present in the plant are hyperoside, chlorogenic acid, and caffeic acid. The two secoiridoid glycosides, loniceracetalides A and B, can be isolated, together with 10 known iridoid glycosides, from the flower buds. The plant also contains the saponins loniceroside A and B and the antiinflammatory loniceroside C.
^ English Names for Korean Native Plants (PDF). Pocheon: Korea National Arboretum. 2015. p. 525. ISBN 978-89-97450-98-5. Archived from the original (PDF) on 25 May 2017. Retrieved 4 January 2017 – via Korea Forest Service. ^ Watts, D. C. (2007-05-02). Dictionary of Plant Lore. Academic Press. ISBN 9780080546025. ^ "Lonicera japonica 'Halliana'". Plants. Royal Horticultural Society. Retrieved 13 July 2018. ^ "RHS Plant Selector - Lonicera japonica var. repens". Retrieved 22 May 2013. ^ "AGM Plants - Ornamental" (PDF). Royal Horticultural Society. July 2017. p. 61. Retrieved 25 March 2018. ^ a b c Shang, X.; Pan, H.; Li, M.; Miao, X.; Ding, H. (2011). "Lonicera japonica Thunb. : Ethnopharmacology, phytochemistry and pharmacology of an important traditional Chinese medicine". Journal of Ethnopharmacology. 138 (1): 1–21. doi:10.1016/j.jep.2011.08.016. PMID 21864666. ^ Bensky, Dan; Barolet, Randall. Chinese Herbal Medicine Formulas & Strategies (2nd ed.). Eastland Press. p. 44. ^ Kumar, Neeraj; Singh, Bikram; Bhandari, Pamita; Gupta, Ajai P.; Uniyal, Sanjay K.; Kaul, Vijay K. (2005). "Biflavonoids from Lonicera japonica". Phytochemistry. 66 (23): 2740–4. doi:10.1016/j.phytochem.2005.10.002. PMID 16293275. ^ Peng, Youyuan; Liu, Fanghua; Ye, Jiannong (2005). "Determination of Phenolic Acids and Flavones in Lonicera japonica Thumb. By Capillary Electrophoresis with Electrochemical Detection". Electroanalysis. 17 (4): 356. doi:10.1002/elan.200403102. ^ Kakuda, Rie; Imai, Mio; Yaoita, Yasunori; Machida, Koichi; Kikuchi, Masao (2000). "Secoiridoid glycosides from the flower buds of Lonicera japonica". Phytochemistry. 55 (8): 879. doi:10.1016/S0031-9422(00)00279-X. ^ Ho Son, Kun; Young Jung, Keun; Wook Chang, Hyeun; Pyo Kim, Hyun; Sik Kang, Sam (1994). "Triterpenoid saponins from the aerial parts of Lonicera japonica". Phytochemistry. 35 (4): 1005. doi:10.1016/S0031-9422(00)90656-3. ^ Kwak, Wie Jong; Han, Chang Kyun; Chang, Hyeun Wook; Kim, Hyun Pyo; Kang, Sam Sik; Son, Kun Ho (2003). "Loniceroside C, an Antiinflammatory Saponin from Lonicera japonica". Chemical & Pharmaceutical Bulletin. 51 (3): 333. doi:10.1248/cpb.51.333. Wikimedia Commons has media related to Lonicera japonica. Species Profile- Japanese Honeysuckle (Lonicera japonica), National Invasive Species Information Center, United States National Agricultural Library. Lists general information and resources for Japanese Honeysuckle.